Delve into US-Cuban Relations and the History of Cuban music with experts. Attend a rehearsal by a Cuban dance company and speak with the dancers. Spend a day in the beautiful landscapes of the Vinales Valley to meet tobacco growers. Enjoy interactions with a local Community Arts Project, an artisan farmer and a Cuban baseball player. Explore Ernest Hemingway’s farm, Finca La Vigia. In the heart of Havana, take an insightful look at music, arts, dance, baseball and private enterprise in Cuba today, viewed through the lives of everyday Cubans. Spend a day in the beautiful landscapes of the Vinales Valley to meet tobacco growers. Meet with Afro-Cuban dancers, artisan farmers and vivacious seniors in the Matanzas region. Enjoy a beachfront location in Varadero. Afternoon: The Road Scholar Group Leader will be in the hotel lobby at 4:45 PM to accompany the group to the orientation room. Welcome and orientation begins at 5:00 PM. Please note: Orientation time may change. Please refer to the final information packet for the scheduled time. Activity note: Most staircases in Cuba do not have railings, so if you use a walking aid, please bring it on the program. All accommodations in Cuba feature clean, comfortable rooms with private baths and standard amenities. Please note that Cuban hotel standards may not equal their American or European counterparts. Improvements are ongoing, and we hope that the potential glitch in service or amenities is a minor tradeoff for the authentic connections and enrichment you’ll experience. Breakfast: A buffet breakfast or boxed breakfast will be included based on the final charter flight time. Morning: Departure from the hotel to the terminal (final flight times will be confirmed during orientation). The Road Scholar Group Leader will meet the group in the hotel lobby to transfer to the airport. Please be in the hotel lobby with your luggage and be ready to depart the hotel 15 minutes before the scheduled departure time. Transfer to the airport and check in to the charter flight to Havana. Upon arrival in Havana, meet your Cuban guide who will provide local history and knowledge throughout the program. Lunch: Visit Proyecto Lucecita, a performing arts community project. After lunch, enjoy a performance by some of the younger members. Afternoon: Begin an overview of Havana. Drive by the Capitolio, the Malecón – Havana’s seafront promenade, U.S. Embassy, La Rampa, and Havana University. Late afternoon arrival at the hotel. Activity note: Walking and standing on cobblestone streets with high curbs and limited shade for 2 hours in Old Havana, mainly on pedestrian-only streets. Morning: Engage in a discussion on the changing economics of Cuba with an expert lecturer. Then, set out on exploration of Old Havana. Begin at the Plaza de Armas, the oldest part of the city. See the Greek­Roman ‘El Templete' site of the first Mass and town council meeting in 1519. Dinner: People-­to-­People Connection: Enjoy homemade cooking prepared by the members of a neighborhood arts center and learn the story of the center’s unique construction. Evening: People-­to-­People Connection: Interact with locals at the neighborhood community arts center and enjoy their music and dance party. Activity note: Full day of motorcoach travel. Walking and standing on unpaved ground for up to one hour. Morning: Set out early and head west to the province of Pinar del Rio, to the famed Vinales Valley, a designated UNESCO World Heritage Site. 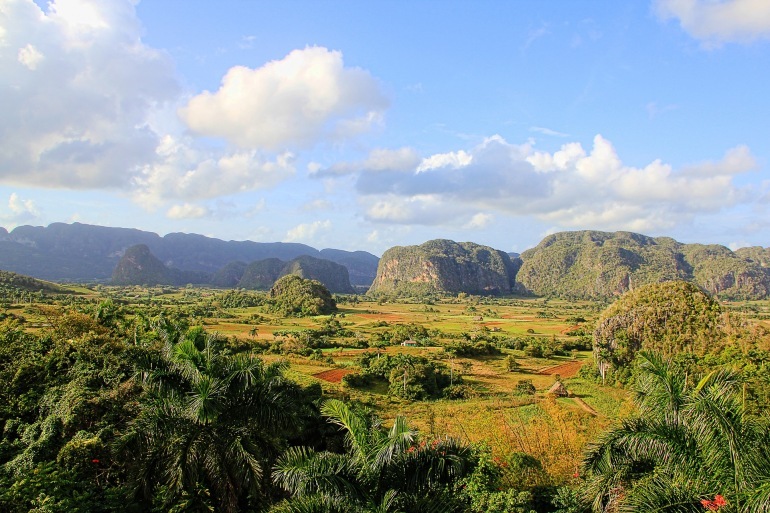 The valley boasts Cuba’s most strikingly beautiful landscapes, with anomalous karst formations rising from the valley floor, unlike any other region of the island. Meet a farmer and learn why the best tobacco is found here. Lunch: Lunch at a local paladar or farm. Afternoon: Stroll the main square of the small village of Vinales before returning to Havana. Dinner: On your own to explore the many paladares of Havana. A list of suggestions is provided in your final information packet. Activity note: Walking and standing for 2 hours in the Fine Arts Museum. There is no elevator. Walking and standing on cobblestone streets with high curbs and limited shade for 2 hours in Old Havana. Morning: A lecture by a musicologist takes you on a journey through the history of Cuban music. After, explore the Fine Arts Museum of Havana with your Cuban guide. Cuban art is renowned worldwide. Delve into the stories that each work of art relays and the statements on politics, culture and society that many artists convey. Afternoon: Continue your guided walk of Old Havana including stops at Plaza San Francisco and Plaza Vieja. Explore the Fortaleza de San Carlos de la Cabana, also known as "La Cabana" or “El Moro”. This fortress protected the mouth of the Havana harbor in its day and offers unique views over Havana - ideal for gaining a better understanding of the city's layout. Activity note: Full day travel by motorcoach with stops en route. Walking and standing for short amounts of time around the farm, on unpaved ground. Morning: Depart Havana by private motorcoach for the drive to Varadero. En route, stop in Matanzas for a People to People Connection with a dance company that preserves Afro-Cuban culture and the traditions of Santeria. Continue to an organic farm which is the home and ceramics workshop of a couple whose unique vision is expressed through both their agricultural and artistic creativity. Lunch: Enjoy a delicious array of homemade dishes prepared from the farm’s produce. Afternoon: Late afternoon arrival in Varadero Beach. Dinner: At leisure in the hotel restaurant. Activity note: People to People experiences include the opportunity to try Danzon steps and participate in a Salsa dance lesson. Morning: People-to-People Connection: Meet a group of vivacious seniors who share their enjoyment of Danzon, the most traditional dance of Cuba with you. People-to-People Connection: Learn how to dance the Salsa, the most popular of Cuban dances, in a fun and energetic dance lesson. Lunch: In the hotel restaurant. Dinner: In the hotel restaurant. Activity note: Coach back to Havana. Walking outdoors. Walking and standing for one hour at Finca La Vigia, with some uneven stairs with no railing. Morning: Drive to the outskirts of Havana to Finca La Vigia, the Hemingway Farm. This beautiful property hosts the house where the Nobel Prize-winning author lived with his third wife Mary for over 30 years. Look into the open windows and doors to see the home in perfect condition with Hemingway’s personal belongings as he left them. Walk the grounds to see his private writing studio, swimming pool, and beloved fishing boat, Pilar. The boat is featured in his novel "Islands in the Stream." Lunch: In a Paladar in Havana. People-to-People Connection: A Cuban Baseball Hall of Fame player joins you for lunch and conversation about his career and Cuban baseball. Afternoon: Visit a community arts center followed by a visit to an artist's studio. Late afternoon arrival at your Havana hotel. (Please Note: The Community Arts Center may be replaced by a visit to a senior center based on availability and scheduling needs). Dinner: Farewell dinner in a paladar. Morning: Departure to Havana airport for return charter flight to Miami. Please allow a minimum of 3-4 hours between arrival in Miami and onward flight connections, as flights from Cuba are often delayed and you must pass through US Immigrations, Baggage Claim and US Customs before proceeding to your Domestic Airline for check-in. (PLEASE NOTE: Flight schedules are subject to change and are beyond the control of Road Scholar). Situated one mile from Miami International Airport (MIA), this modern Miami, Florida hotel adjoins the Miami Airport Convention Center and the Miami International Merchandise Mart, which is also open to the public. The hotel is a 10 minute drive from the airport and offers a free shuttle service from the airport to the hotel. To call the shuttle upon arrival at the airport: On the 2nd Level / Departure Level, go to the nearest outside door and identify the Door number. Call the hotel on (305) 261-3800 and tell them your location. The shuttle will come and pick you up upon request. Located in the center of Havana, The Nacional Hotel is situated on a vantage point overlooking the Malecon – Havana’s seafront promenade. The Hotel Nacional de Cuba has hosted numerous illustrious guests: actors, artists and many other famous people. The hotel is a National Monument and is inscribed in the UNESCO Memory of the World Register. Located beachfront on Varadero Beach, The Meliá Varadero is a modern, five-star all-inclusive resort featuring recently renovated rooms.